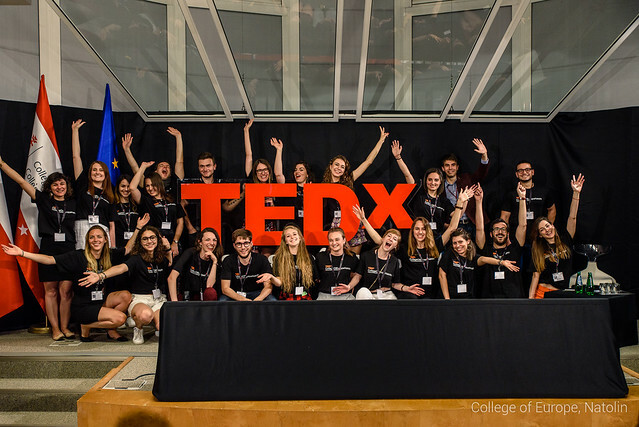 On 20 June 2018, a group of Natolin students organized the third edition of TEDxCollegeOfEuropeNatolin around the theme: Embracing Diversity. At this unique and innovative event at the College of Europe in Natolin, students of the Simone Veil Promotion and guests could learn more about this essential issue of our modern life through inspiring speeches. Different personalities from around the world delivered performances describing how they managed to challenge themselves. A TEDx event is a local gathering where live TED-like talks and videos previously recorded at a TED conference are shared with the community. TEDx events are fully planned and coordinated independently, on a community-by-community basis. A TEDx event is a suite of short, carefully prepared talks, demonstrations, and performances that are idea-focused, and cover a wide range of subjects to foster learning, inspiration, and wonder – and provoke conversations that matter. Our goal is to spark conversation, connection, and community. The third edition of TEDxCollegeOfEuropeNatolin hosted by Mr Mark DEKKER, an improvisational actor, and passionate entrepreneur, aimed at exploring the depth of Diversity, addressing the "elephant in the room" and inspiring society to make changes that destruct walls and construct bridges. Mr Emil BALAVAC, a youth worker, a human rights and peace activist with a strong belief that solidarity and embracing diversity is the only way into the future. He holds university degrees in international and comparative law and diplomacy. His current work includes being Program Manager in the Youth club "Under the same sun", leading the Jablanica Municipality Youth Council, as well as working for UNDP on insider mediation and promotion of dialogue, for the International Organization for Migration (IOM) on preventing violent extremism in local communities, and as administrator of the municipal election commission. His previous working experience includes both local, regional and international organizations, as well as governmental institutions of Bosnia and Herzegovina. He is also a member of the board of Youth Peace Ambassadors Network. Ms Julie DACHEZ, PhD in social psychology. She was diagnosed with autism, Asperger syndrome, at the age of 27. Since then, her life changed and she reconciled with her deep identity. Speaker and transmedia author, she expresses herself either on blogs as well as on youtube. She is the author of La différence invisible (The invisible difference) and Dans ta bulle (In your bubble). Ms Amel HAMMAMI, student of the College of Europe. She has worked as a researcher on radicalization/deradicalization. In 2016 and 2017 she worked as a legal expert in the Truth and Dignity Commission of Tunisia where she was responsible for investigating the truth about the various abuses of human rights under the dictatorship. She has a long experience as a human rights activist since 2006 with the General Union of Tunisia Students, the Tunisian league of human rights and other civil society actors. She aspires to promote the values of tolerance, diversity and peace in her society. Ms Mariam LUTFI ROYO, student of the College of Europe. She learnt to talk and dance before walking. Dancing is her passion in life, energetically combining it with her studies in Law and in European affairs and any other activity she finds interesting. One unexpected day, Mariam was diagnosed with leukemia and her fast-moving world stopped abruptly; but after using her most powerful tools, keeping positive and dancing, she overcame this disease. This dancer tries to break our society’s bubble of fictitious calm in order to positively raise awareness about leukemia in two directions: first, she defines people who suffer from leukemia not as weak, but unstoppable, stronger and more alive than ever; and second, she demonstrates how solidarity is the perfect ingredient to make this disease 100% curable. Ms Ewa RUMIŃSKA-ZIMNY, PhD. in economics, is currently a Gender Studies lecturer at the Polish Academy of Science. She is the President of the International Forum of Women in Science and Business at the Warsaw School of Economics and Board Member of the Congress of Polish Women Member at the Experts’ Forum of the European Institute for Gender Equality (EIGE). In the past, Ewa worked at the United Nations in New York as a senior economist at the Human Development Report Office and as Gender Focal Point and Head, Gender and Economy programme at the UN Economic Commission for Europe responsible for regional reviews of the Beijing Platform for Action (2000-2009). Ewa used to be a visiting professor at Georgetown University, Washington D.C. and professor at Warsaw School of Economics. Mr Roman TORGOVITSKY, a creator of an integrative medical program called "Soma System", which is based on his PhD research in sleep medicine, brain imaging, and mathematical epidemiology at Harvard University. Roman is the founder of an American non-profit "Healing War Scars" and the charity "Warrior’s Heart" in Ukraine. These two organizations use soma system methodology to help veterans to reintegrate into society. Ms Solomiya VITVITSKA, a news presenter of 1+1 Channel (Ukraine) who has launched a multimedia project "Peremozhtsi" ("Victors") that tells the stories of Ukrainian soldiers who lost their limbs in the military conflict, raising an essential question in a society and state poorly prepared for these people. For more details and information on all speakers, please visit the website of TEDxCollegeOfEuropeNatolin or follow them on Facebook or Instagram. The videos from the event will soon be available on our Youtube channel.